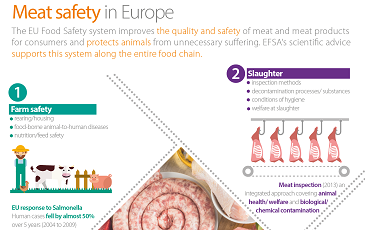 Existing safe levels for nitrites and nitrates intentionally added to meat and other foods are sufficiently protective for consumers, EFSA has concluded after re-evaluating their safety. Consumer exposure to nitrites and nitrates as food additives is within safe levels for all population groups, except for a slight exceedance in children whose diet is high in foods containing these additives. However, if all dietary sources of nitrites and nitrates are considered, the safe levels (ADIs) may be exceeded for all age groups. Sodium and potassium salts of nitrite and nitrate (E 249-252) are authorised as food additives in the EU. They are used in meat, fish and cheese products to hinder microbial growth, in particular to protect against botulism, as well as to keep meat red and enhance its flavour. Nitrate is also found naturally in high concentrations in certain vegetables, and it can enter the food chain as an environmental contaminant – mainly in water. The current acceptable daily intake (ADI) for nitrates is 3.7 milligrams per kilogram of body weight per day (mg/kg bw/day). The safe level for nitrites was re-established at 0.07 mg/kg bw/day, close to the slightly more conservative existing ADI of 0.06 mg/kg bw/day. Using a refined exposure assessment, experts estimated that consumer exposure to nitrate solely from food additives was less than 5% of the overall exposure to nitrate in food, and did not exceed the safe levels. However, if all sources of dietary nitrate are considered (food additive, natural presence in foods and environmental contaminants), the safe level may be exceeded for individuals of all age groups with medium to high exposure. What do we mean by exposure? Exposure is the concentration or amount of a particular substance that is taken in by an individual, population or ecosystem in a specific frequency over a certain amount of time. When experts assess consumers’ dietary exposure to a chemical substance, they combine data on its concentrations in food with the quantity of those foods consumed. Children are often more exposed to substances because of their higher food consumption levels relative to their body weight. For nitrites used as food additives, experts estimated exposure to be within safe levels for all population groups, except for highly exposed children, who might slightly exceed the ADI. Exposure from all dietary sources may exceed the ADI for infants, toddlers and children with medium exposure, and for highly exposed individuals of all age groups. Nitrite is also linked to the formation of a group of compounds known as nitrosamines, some of which cause cancer. EFSA’s experts therefore also estimated their formation inside the body following the use of nitrites as food additives. They concluded that when nitrites are used at approved levels, their contribution to overall exposure to nitrosamines is of low concern for health. Nitrite unintentionally present in meat products from other sources such as environmental contamination can also contribute to the formation of nitrosamines. EFSA’s experts concluded that these levels of nitrosamines might give rise to potential health concerns but that more research was needed to address uncertainties and knowledge gaps in this complex area. Prof Younes said: “After looking at all available evidence we concluded that nitrites and nitrates added to food at permitted levels are safe for consumers in Europe. However, there are still some knowledge gaps to be filled by future research. EFSA’s scientific advice will inform risk managers in the European Commission and Member States who regulate the safe use of nitrites and nitrates as food additives as well as their overall levels in food in the EU. EFSA has prepared a plain language summary explaining and contextualising its re-evaluation of nitrite and nitrate added to food for non-expert audiences.